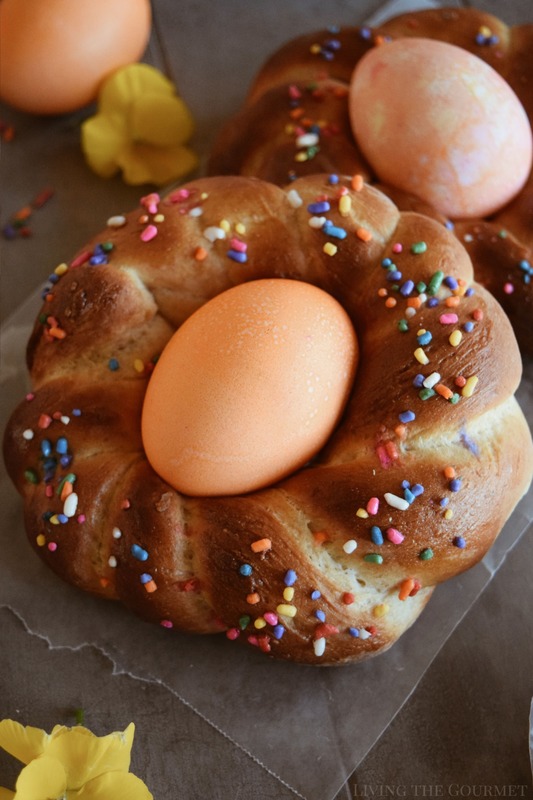 This traditional braided bread is slightly sweet and soft, and best served warm for a perfect treat on Easter morning! When I think of Easter Bread, I think of the colorful loaves or buns that are typical of bakeries here in New York. 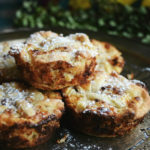 They tend to be sweet but not overly so, often being somewhere in the realm of a ‘dessert muffin’ or ‘coffee cake.’ In terms of appearance, they can be decorated with glazes, sprinkles, and sometimes colored eggs, since they’re intended to be as much a feast for the eyes as for the palate. 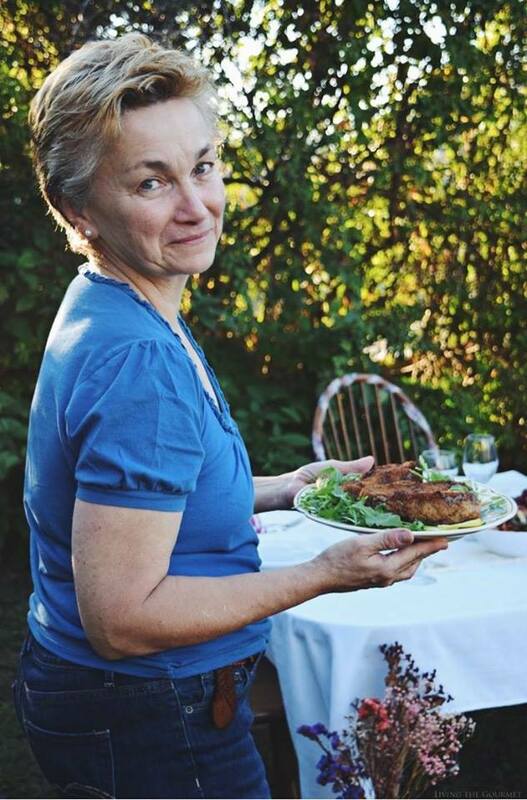 Naturally, we would never buy these breads – my mother always made her own. The origins of ‘Easter Bread’ are hazy to say the least – in part because virtually every cultural group in Europe claims some version of this bread as their own, and almost no two are alike…at all. For example, German ‘Osterbrot’ typically resembles a loaf of plain raisin bread with the addition of chopped almonds, and sometimes features a glaze, and rarely a colored egg as decoration. On the opposite end of the spectrum, Spanish Hornazo is a savory ‘meat bread’ with chorizo, hard boiled eggs, and bacon folded inside. Growing up, my family’s Italian version of Easter Bread – ‘Colomba Pasquale’ – was a loaf my mother would form into the shape of a dove. The loaf was semi-sweet, though slightly sweeter than the more familiar pannetone, and had candied fruits and peels baked in. After baking, the loaf was topped with a white glaze and coarse sugar. While most often served as coffee cake in the morning, it was more like ‘dessert for breakfast,’ at least in my mind. Back then, you could sometimes find these in Italian bakeries and grocers imported them from Italy during the Easter Season. So, what’s the right way to make Easter Bread? Whichever way brings you the most joy, of course, and for someone like myself who thinks of those sweet and colorful confections from the windows of New York bakeries when I was growing up, that’s precisely where today’s recipe comes in. Now, I know what you’re thinking as you’re looking at the pictures, that this is hard, and…yeah, it’s not going to be easy. Just follow along, and you’ll do fine. We begin by sweet-proofing some yeast. To do this, we heat milk in a small saucepan until it’s warm to the touch. You want to warm it, not scald it. Scalding takes about four minutes, so you’re not going to want to heat this for more than two. Once warm, transfer the milk to a sturdy glass – I prefer a mason jar – and then add in your yeast and a tablespoon of sugar. Set this aside and let it froth. No, don’t cover it. Next, in the bowl of a stand-mixer with the hook attachment in place, combine your flours, three tablespoons of sugar, and a teaspoon of salt. Add your proofed yeast to the mix, along with butter, eggs, and honey. Now mix the dough on low speed until it comes together as a smooth, soft dough. Cover the dough and let it rest in a warm place for about two hours. You want the dough to roughly double in size. Transfer the dough onto a well-floured surface, and begin gently kneading the dough into a smooth ball. Now, divide the dough in half, and then divide those halves into quarters. You want to end up with eighths. No, you cannot just cut the dough into eighths. Trust me on this. Working with one of those pieces, divide it yet again, and then ‘rope’ those halves until they are about twelve inches long, and then twist the ropes together as shown below. You want to construct ‘wreaths’ as pictured below. Repeat this process with each piece of dough, setting the wreaths on a baking sheet covered with parchment paper. When you’re done, cover the wreaths with a cloth, and let them rise in a dark, warm place for about an hour. After that’s done, brush the breads with an egg wash, and top with colored sprinkles, and then bake for about ten minutes at 400 degrees Fahrenheit, or until golden. Begin by proofing your yeast. In a small saucepan, heat milk just until warm to the touch. Transfer to a glass then add your yeast and 1 tablespoon of sugar. Set aside and let the yeast froth. In the bowl of your mix master with the hook attachment, combine flours, remaining tablespoons of sugar, and salt. Once your yeast has proofed, add to the flour mixture along with butter, eggs, and honey. Mix the dough on medium-low speed until a soft dough comes together. Cover the dough and let rest in a warm place for at least 2 hours, or until the dough has doubled in size. Transfer the dough onto a well-floured surface and lightly knead into a smooth ball. Divide the dough ball in half, then in quarters. Working with one of the quarters, divide them in half and 'rope' both halves until about 12" long. twist the ropes together, then make a wreath with them by pinching the edges. Place each wreath on a parchment-lined baking sheet. Repeat this process for the rest of the quarters. Cover the Easter breads and let rise once again in a warm place for about 1 hour. Brush the Easter breads with an egg wash, then top with colored sprinkles. Bake for about 10 minutes or until the breads are golden. 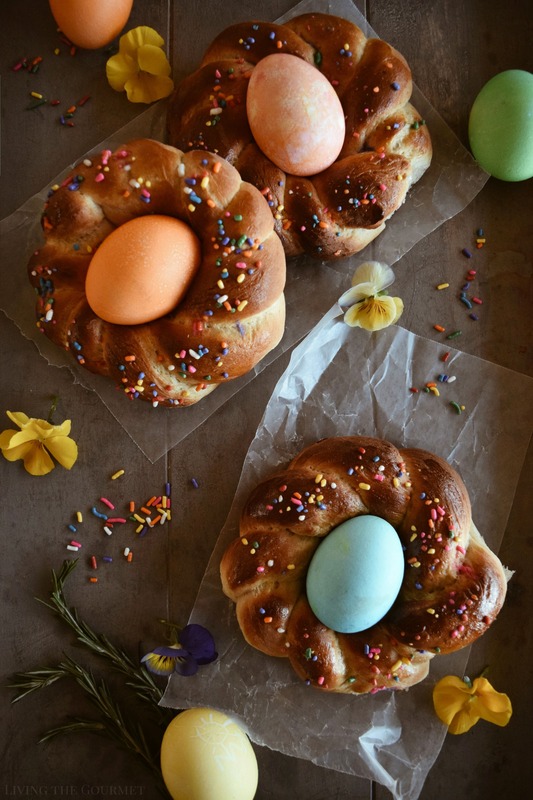 If you choose to serve these breads with colored eggs, be sure to let them cool to room temp before place the colored eggs in the center of the hole. Serve and enjoy! These bread will keep for up to 1 week. Prep Time does NOT include Inactive Prep Time. You can, of course, serve these with cooled colored eggs propped in the middle. And this is what I think when I think Easter Bread. 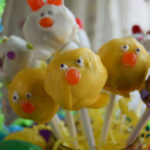 What are some of your favorite Easter themed confections? I would love to hear from you! Mmm-MMMM! I can't wait to make this. I love that hint of sweet, and the braided rings just look so darn cute. This is great! I hope you enjoy it if you give it a try. They are pretty and festive for the holiday too. what lovely and perfect Easter bread! so beautiful Catherine! Beautiful and delicious! Happy Spring, Catherine! Not only do these look and sound DELICIOUS, they are absolutely adorable and perfect for Easter! Thank you. They do brighten up the Easter table. 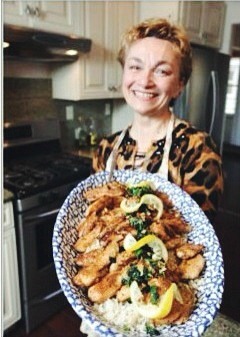 It's one of my favorite recipes for Easter, I don't know how to cook it, but I love eating it! It is not difficult if you decide to give it a try. I love eating this bread too. Thank you for visiting. it is not difficult if you decide to give it a try. I do hope you enjoy it. I think it's a nice tradition to have an Easter Bread. I am European but I didn't hear about this tradition, we didn't have it in my family. We did however have other Easter traditional foods. I do enjoy learning all the different traditions for the holidays. Thank you for visiting. I have never seen anything like this before! The presentation is flawless, and they look so delicious! My family will love these. Thank you. I hope you and your family enjoy it if you do give it a try. I love Pizza Giana too. This bread I think you would enjoy as well. Oh wow, I've never heard of Easter bread but it sounds like such a lovely tradition. I wonder if this is more of an East Coast thing? I grew up in California and have never seen bakeries make these. 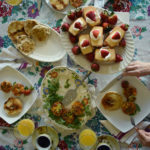 Easter was usually mass then brunch! I would like to incorporate this into our tradition though, I'll give this recipe a try. I don't know if it is only a East coast tradition but the bakeries were always filled with these pies. Unfortunately, there really are not that many bakeries around as there were in the past. 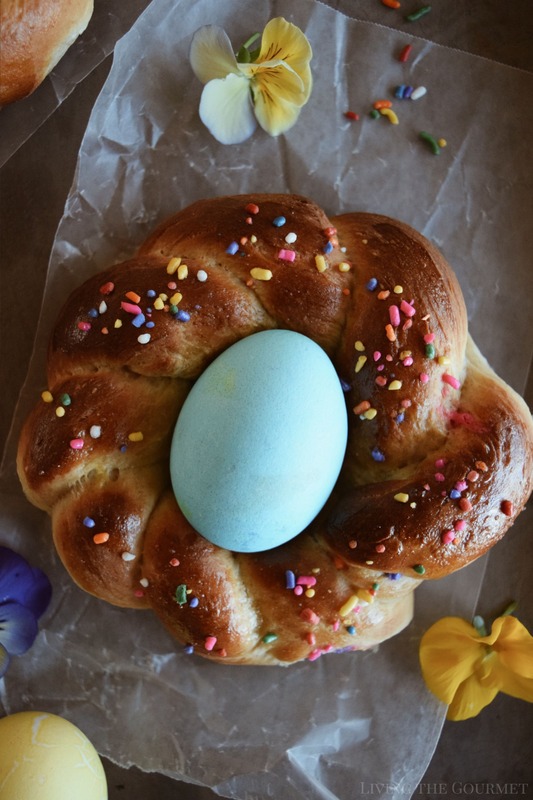 This Easter bread looks so delicious! I might have to make this for Easter morning. This looks like such an awesome recipe! This is on my radar for Easter morning! What a creative idea! I like it. One thing is I don't know how to bake although I do own an electric oven it's a gift from my hubs and I've never touched it ever since I had it. Maybe I should go explore and give this one a try. Thank You for sharing your creative baking idea! I hope you enjoy it is you do. This looks nice and simple to put together but so delicious! Perfect for an Easter treat! This bread looks like it would be so fun to make. My kids would really enjoy doing something like this! I hope you like it. I think the kids would very much enjoy it. 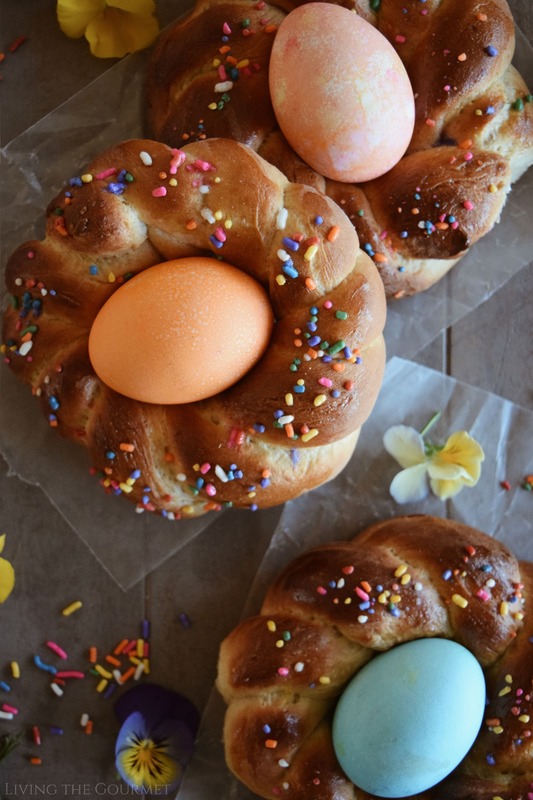 I've never heard of Easter Bread before actually but now I definitely want to make my own! It does sound like it'll be a bit tricky but I've never been one to turn down a challenge! It really is not difficult. I am sure you will live up to the challenge. I hope you like it. Absolutely adorable. Too cute for Easter festivtites for the sunday dinner! The bread and the recipe looks splendid. The awesome photos make it all the more inviting. Looks good and delicious. A topping of sprinkles makes this looks cheery ideal for Easter. 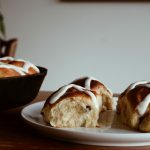 My mom always made Easter bread this time of the year and this post brings back such great memories of Easter on the farm. I. have yet to make this holiday treat but your recipe and directions make it look very doable; thanks for the inspiration! I hope you will enjoy it. Sharing memories and making memories is such a gift. Amazing idea to making this Easter special. Have to surely try your recipe which looks so interesting. 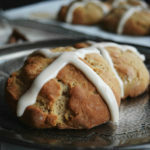 I love making Easter bread...love that this is made with whole wheat flour! Gorgeous with sprinkles too :) this is a great showstopper for an Easter table. 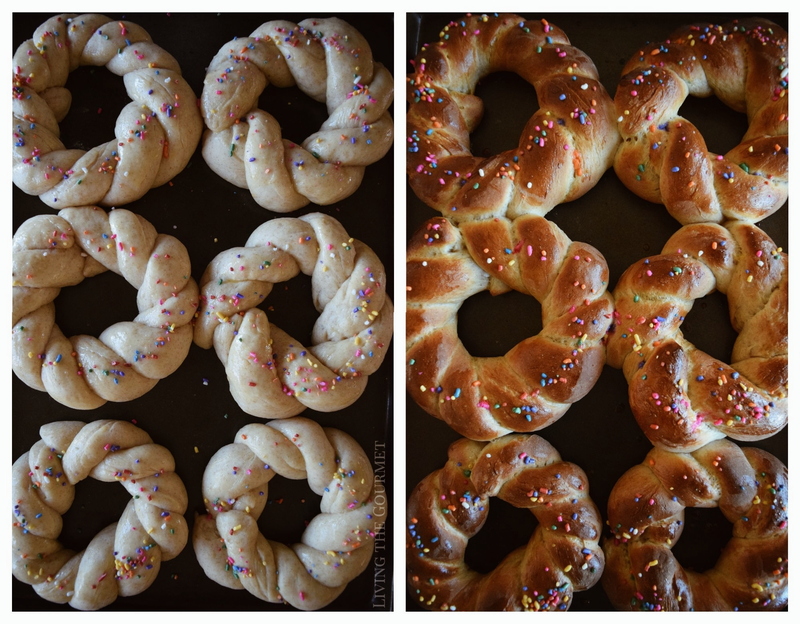 Oh wow, these Easter bread look so pretty! And those braids look so fun to make. Pinning this recipe so I can make this bread asap. I love that these are slightly sweet but not overly so. 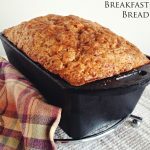 They are the perfect brunch bread for any Easter celebration! Those braids are beautifully done and the perfect golden brown! I love the addition of wheat flour too to your recipes! They sound delicious with just a hint of sweetness! What a wonderful treat for Easter! I love that this recipe looks easy and another great way to use dyed eggs. Oooo so pretty! I love your helpful video showing how to braid your beautiful bread. This is going to be so much fun to make with my girls! I saw something like this years ago and I thought it looked like such a fun tradition. It looks so elegant. When I think of Easter, this is the first thing I think of! 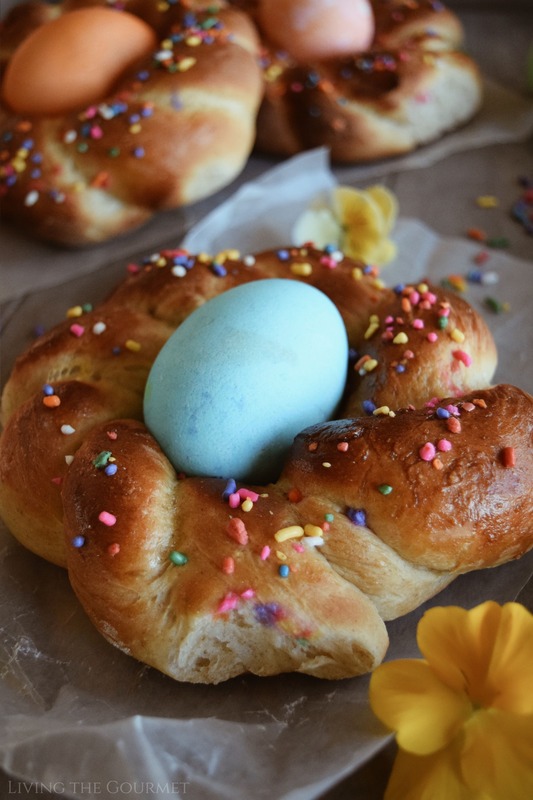 The colorful eggs and beautiful braided dough! You've done a wonderful job with the details for this recipe, my family is definitely going to enjoy it. I made this yesterday and it was fantastic! I can't wait to make it again and again. Can't beat an easy and delicious bread like this! I love braided bread! What a wonderful treat for Easter! These would be memorable and delicious and beautiful to display on the table too!